5 Bedroom Semi Detached House For Sale in Norwich for Offers in excess of £240,000. This four/five bedroom house would suit large families or an investor looking for a great rental opportunity. Motum Road is set off Larkman Lane near Dereham Road and is well placed for the UEA and the hospital. The property is close to a major bus route into Norwich city centre, and is within easy walking distance from an Aldi supermarket, convenience stores, take-aways and a restaurant with the Longwater retail park only minutes away. Beyond this lies the A47 and A11. 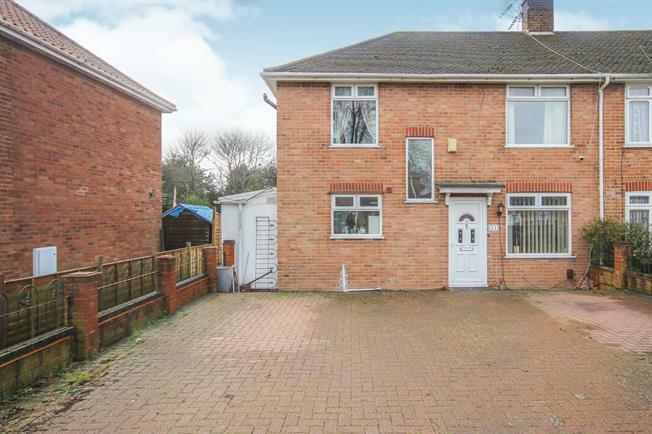 Heavily extended, this four bedroom, semi-detached house offers buyers considerable space for family living or for investors to create a great rental property. The ground floor gives a large lounge, kitchen and the full width extension offers a dining room and large family room, either of which could make an extra ground floor bedroom. There is also a handy utility/store area running down the side of the property. The first floor has four double bedrooms all well-matched in size. The vendor has replaced the central heating system with a boiler with a ten year warranty. Also the vendor will be leaving the 16 solar panels which generate around a thousand pounds a year along with cheaper electric bills. To the rear is a covered terrace leading to a lawn with two storage sheds. To the front is a wide driveway giving parking for three or more cars.